If you are doing some real hauling, it's time to step up to the 2015 Ram 2500. Sulphur Springs Chrysler Dodge Jeep Ram knows a thing or two about heavy duty trucks, and we are happy to help you pick a great one out. Ram 2500 trucks feature powertrains made to move heavy loads, starting with the 5.7-liter Hemi V8 with variable valve timing, stepping up to the 6.4-liter Hemi Mid-Duty V8, and topping out at the legendary Cummings 6.7-liter inline-six turbodiesel. A six-speed automatic transmission is standard, but options include a heavier duty six-speed automatic, and a six-speed manual. Rear-wheel or part-time four-wheel drive are available. Properly optioned, a Ram 2500 can tow nearly 17,000 pounds. 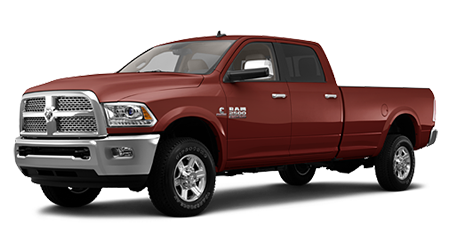 Ram 2500 models come in three body styles and many trim levels. There are Regular Cab, a Crew Cab, and Mega Cab sizes available. Trim levels include Tradesman, SLT, and Laramie, with special packages available as well. The Tradesman (not available in Mega Cab) is a no-nonsense work truck, but still comes with AC, cruise control, tilt steering, locking tailgate, and a six-speaker sound system with iPod/USB and auxiliary input jacks (plus power windows and locks on Crew Cabs). Step up to the SLT trim and get keyless entry, power locks and windows, integrated trailer brake, chrome trim, and a 5" touchscreen controlled Bluetooth infotainment system with voice commands (plus power rear sliding window on Crew and Mega Cab). Texas buyers can get a special Lone Star edition, which adds 18" alloy wheels, more chrome trim, fog lights, limited slip differential, and an upgraded ten-way power adjustable driver seat. There is also an Outdoorsman package for 4x4 trucks, similar to the Lone Star, but adding more off-road goodies and the 8" touchscreen Uconnect system. Laramie is the top trim level and includes all the Lone Star options, plus heated leather seats, rearview camera and parking sensors, and a ten-speaker surround sound entertainment system. Longhorn and Limited packages make the Laramie trucks even more luxurious inside and out. Standing alone is the Ram 2500 Powerwagon, a serious off-road truck. Only available as a Crew Cab 4x4, the Powerwagon still comes in your choice of the three trim levels. However, every one of them features a lift kit, skid plates, locking differentials, 12,000-pound winch, and serious off-road tires. Sulphur Springs CDJR wants to put you in a strong, tough 2015 Ram 2500 today. We're an easy drive from Tyler, Greenville and the rest of Hopkin County and offer the best selection in Texas!